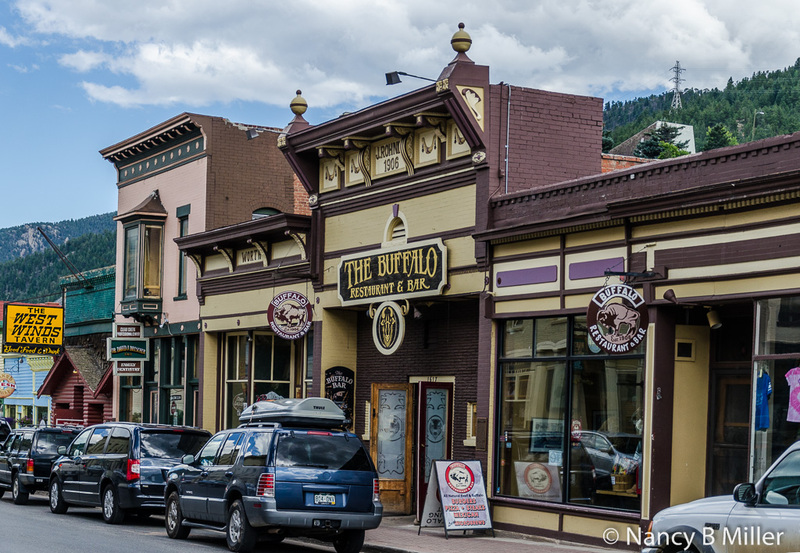 For those looking to explore Idaho Springs and Mount Evans, the following are suggestions for a two day itinerary. 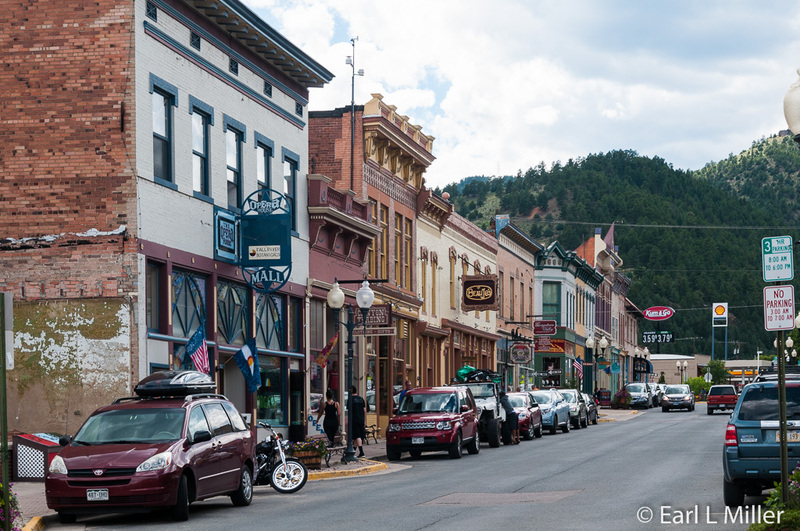 In Idaho Springs, you’ll find Bridal Falls, a huge 30-foot water wheel, and a visitors center with a small historical museum. For lunch, stop at the historic Buffalo Inn. Conclude your day with a scenic drive over Oh-My-Gawd-Road to Central City and Blackhawk. Here are the details. You can spot these while following I-70. For a closer look, park behind the Buffalo Restaurant, walk under the expressway, and follow the paved path up the hill. They are on the opposite side of Clear Creek. Several guidebooks list Bridal Falls as 600 feet tall, but we are convinced an extra zero was added in error. Bridal Falls may reach100 feet. But that’s stretching it. Adjacent to the falls is the120-year-old water wheel. The wheel has a 33-foot diameter and weighs three tons. It was built by Charlie Tayler, a miner, in 1893. Tayler was a real character. He said he lived to the ripe old age of 94 because he never kissed women or took baths. He used the wheel to power a stamp mill that processed ore at his gold mining operation on Ute Creek. 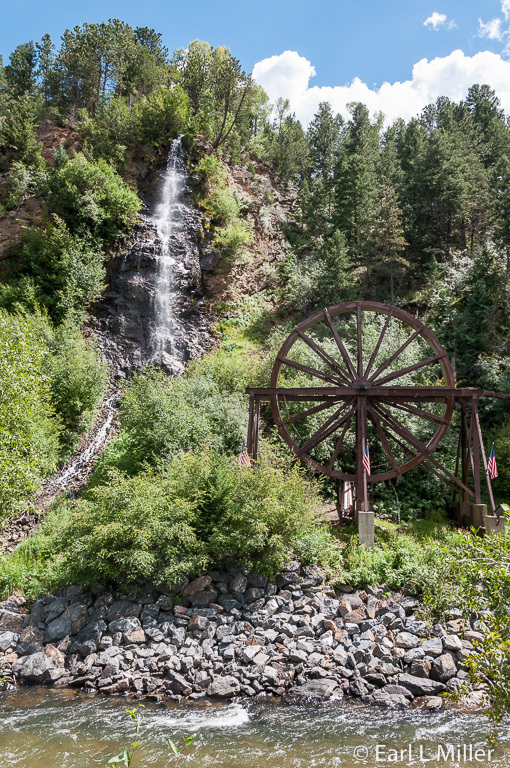 In 1946, after Tayler’s estate donated it to Idaho Springs, the wheel was moved from the gold mining stamp mill to its current location. 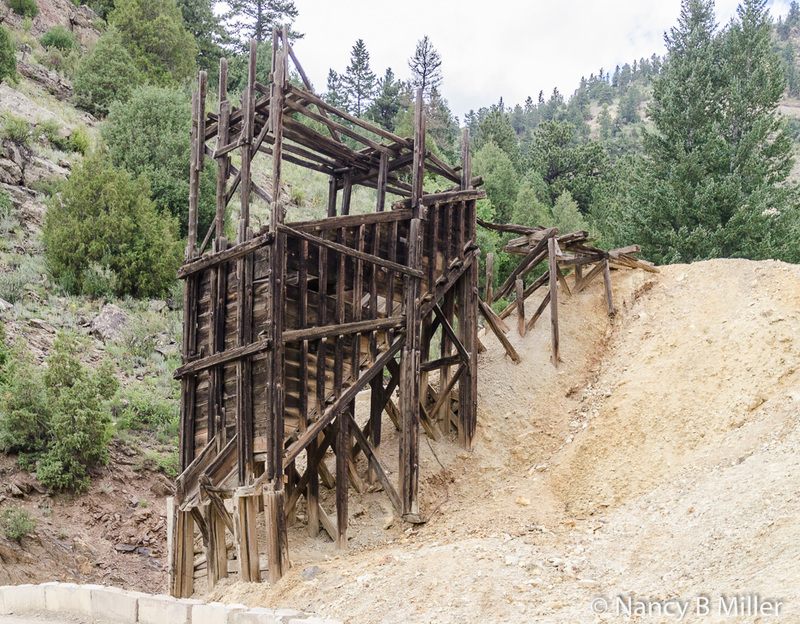 It was restored and dedicated during the Idaho Springs Gold Rush Days in 1988. The Buffalo Restaurant and Bar has quite a history. Its interior now connects four adjoining buildings first constructed in 1881. The main building was the Golden Rule Mercantile Store. John Rohner was a bartender, who fought for the world’s heavyweight championship. In 1904, he asked Worth, who owned the building next door, for a nickel raise and was refused. He stomped out vowing to put Worth out of business. Rohner purchased and remodeled the restaurant’s main building in 1906. He opened it as John Rohner’s Bar and Billiard Hall. It was renamed in 1963 the Buffalo Restaurant and Bar. Even the antique bar, back bar, and breakfront are historic. They were built in early 1860 in Chicago then sent by wagon train to the Cosmopolitan Hotel in Telluride where Billy the Kid was a frequent visitor. When the Cosmopolitan Hotel closed, the bar and cooler moved to Denver’s Windsor Hotel’s Belle Star Room. When the Windsor was demolished, they were saved and moved to Idaho Springs where they were restored. When visiting this restaurant, take time to view their collection of antique signs. You’ll also find an original 1865 New York Herald newspaper clipping, near the bar, telling of Lincoln’s assassination. The restaurant is open for lunch and dinner. They specialize in buffalo dishes including buffalo meatloaf, hot dogs, steaks, and burgers. But they also offer alternative dishes. They have a gift shop and have a coupon for 10% off a food order on their web site. Hours are 11 a.m. to 10 p.m. daily. They’re located at 1617 Miner Street in Idaho Springs and (303) 567-2729 is their telephone number. A gift shop, three-room museum with static displays, and staff who are supposed to be able to answer area questions is what visitors to the Heritage Visitor Center find. I was turned off when the woman staffing it couldn’t answer how tall their waterfall was. I was further put off when they advertised at their water wheel exhibit that they had a booklet on this wheel for sale. The same woman told me the booklet was not available. The museum’s major part is devoted to the community’s development via mining and the railroad. An interesting exhibit, in the first room, was about George A. Jackson, who discovered placer gold, at Idaho Spring’s present site on January 5, 1859. It was Colorado’s first substantial gold discovery. Through dioramas, it depicts Jackson’s finding. They have a copy of a page from his diary. You’ll also spot an old ore car from the Gold Belt Mine, which carried 3,000 pounds of rock and mining tools. In that same room, visitors find an exhibit, in a large case, on the Idaho Springs Depot built June 17, 1877. It served two scheduled passenger and one freight train daily until1927 with the last train running in 1941. The line ran from Golden to Silver Plume. At the town’s city hall, you can see an old Colorado Southern locomotive which ran on these tracks. A second room features the Clear Creek Watershed Foundation with an explanation of abandoned mines reclamation. The third houses Idaho Springs artifacts. It ranges from a Native American display to an exhibit on the 10th Mountain Division of the U.S. Army who trained at Camp Hale during World War II. In this room’s glass cases are camera equipment, Victorian dresses, and gem stones as well as railroad and mining artifacts such as model trains and signal lanterns. Another case houses historic documents such as the town’s plat. 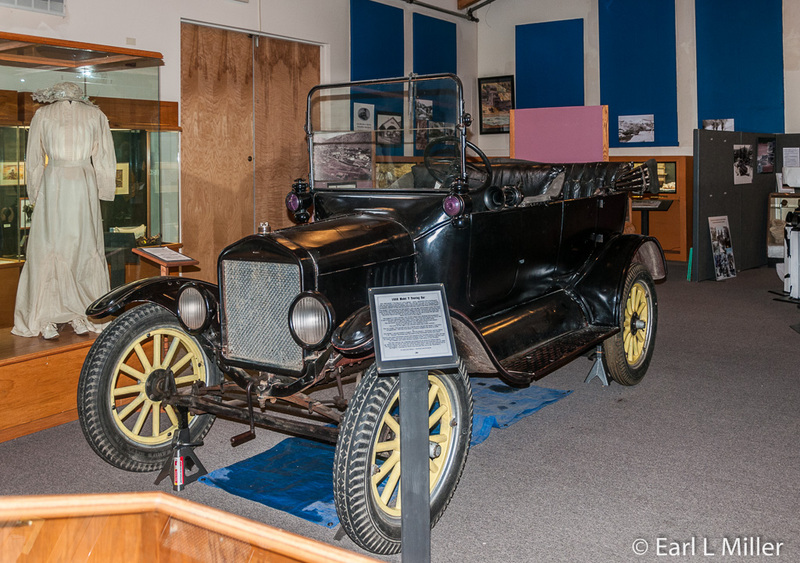 The room’s 1920 Model T touring car is in excellent condition. You’ll find Heritage Museum at 2060 Miner Street. Their phone number is (303) 567-4382. Admission is free. This gravel road from Idaho Springs to Central City provides views of Mount Evans and the Continental Divide as well as old mining sites. Though touted as difficult to drive with narrow and curving lanes, we found the road up Mount Evans much more stressful. In fact, this road was a breeze to traverse compared to some we have traveled. In short, it does not live up to its name. To drive it, take I-70 to exit 241 into Idaho Springs. Take Colorado Boulevard into town. At the fork in the road, stay to the right, then take the second right onto Virginia Canyon Road. On day two, make it day one if the weather is clear, drive from Idaho Springs on Colorado State Highway 103 to Mount Evans. 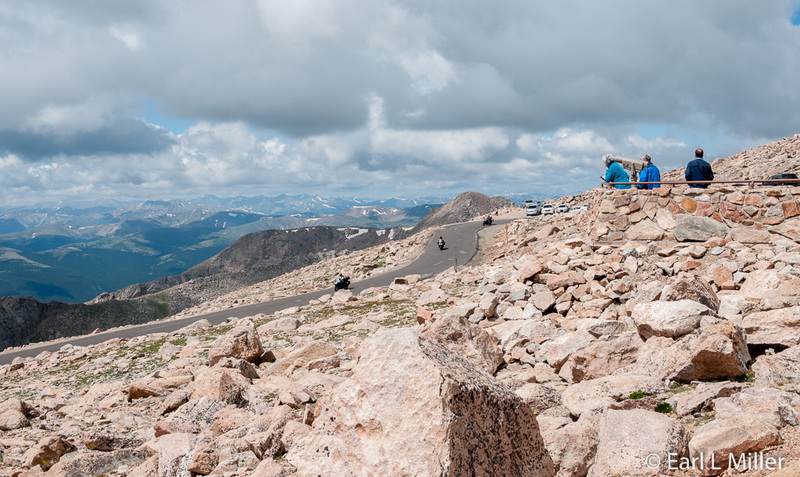 You’ll want to drive Mount Evans Road (Colorado State Highway 5) to its Summit. There are several places to stop on the way including numerous overlooks. We traveled the route on two separate days as we were fogged in the first day making it impossible to photograph. On the second day, we made it to the summit. 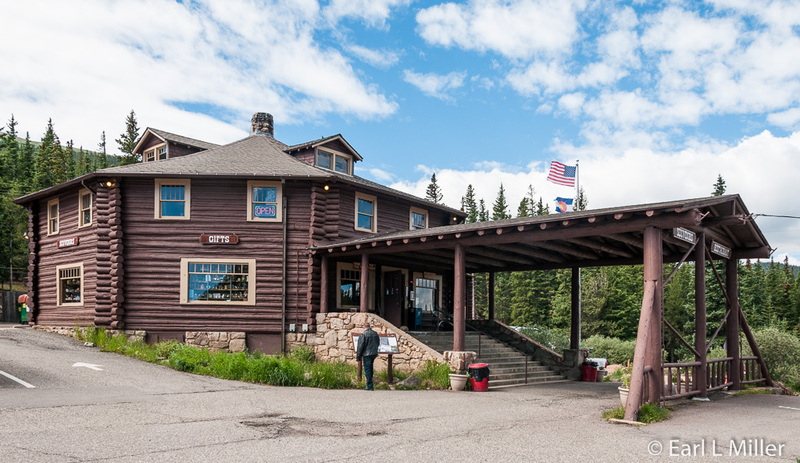 Stop at Echo Lake Lodge Restaurant and Gift Shop, before you drive up Mount Evans to pick up the newspaper for $1 called the Mount Evans Journal. It’s a great source of information and definitely worth the dollar cost. Opened since July 4, 1926, the lodge made several improvements in 1927, including the addition of a large dance hall currently serving as their dining room. For over 50 years, the Lodge leased rooms which now house their staff. We discovered they serve very good food and thoroughly enjoyed our lunch there. The menu includes everything from breakfast scrambles, burgers, buffalo chili, pan fried trout, to homemade pie. The burgers were huge. 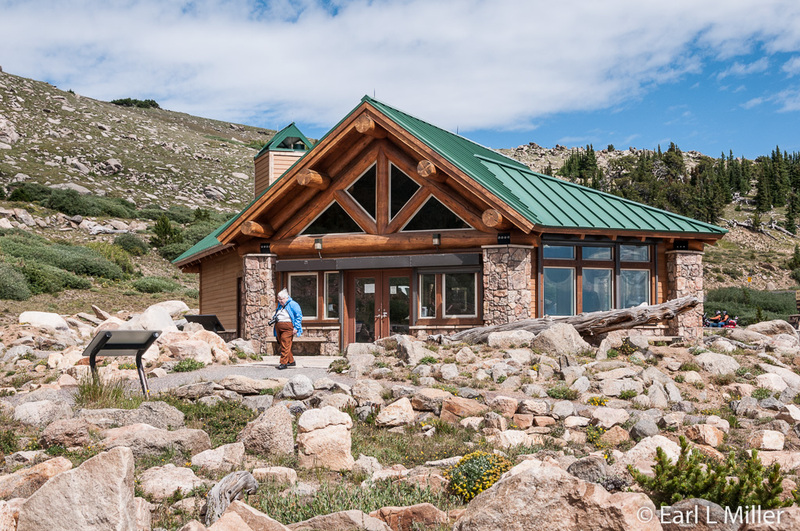 It’s also the only place for restrooms until you reach Mount Evans’ summit. Echo Lake Lodge has a historical past. In 1944, it was taken over by the Army and became part of the Army Air Corp Arctic Training Division. It was the only Division of its kind. Camp Echo had over 100 men with many tents and additional buildings surrounding the lodge and Echo Lake. In 1945, the training camp transferred to Great Falls, Montana. In 1965, Denver Mountain Parks leased Echo Lake Lodge to HWStewart Inc. Today the fifth generation of this family owned company operates the lodge. They also managed the Mount Evans Crest House, at the mountain’s summit, from 1956 to 1979, until that structure burned down. The lodge is open daily. From Memorial Day through Labor Day, it's open 8 a.m. to 8 p.m. while during the spring and fall, it’s 9 a.m. to 5 p.m.
Echo Lake, which it adjoins, is part of the Denver Park System, as is Route 103 from Idaho Springs to Mount Evans. The lake is a popular fishing spot stocked several times each summer with rainbow trout. A fishing license is required. Mount Evans is on land managed by the U.S. Forest Service. To enter Mount Evans Road (Route 5), it’s necessary to stop at their toll gate near Echo Lake. For those who don’t have federal passes, it’s $10 per carload. Route 5 is the highest paved road in the world. Three miles up the road, visitors find the Mount Goliath Research and Recreation Area. It’s a 160-acre preserve set aside for education and scientific research. Take time to stop at the Dos Chappell Visitor Center to view exhibits on survival stories of plants and animals. It’s open daily and staffed by rangers who give two interpretative talks daily. One talk is called “Creature Feature.” It’s from 3:15 to 4:15 p.m. on the traits of animals living in the alpine and subalpine life zones of Mount Evans. The third life zone present on Mount Evans is the montane. Plants also vary on the mountain depending on the location where they are growing. We were there at noon for the 30-minute “The Ancient Ones.” It’s a walk and talk on Bristlecones. 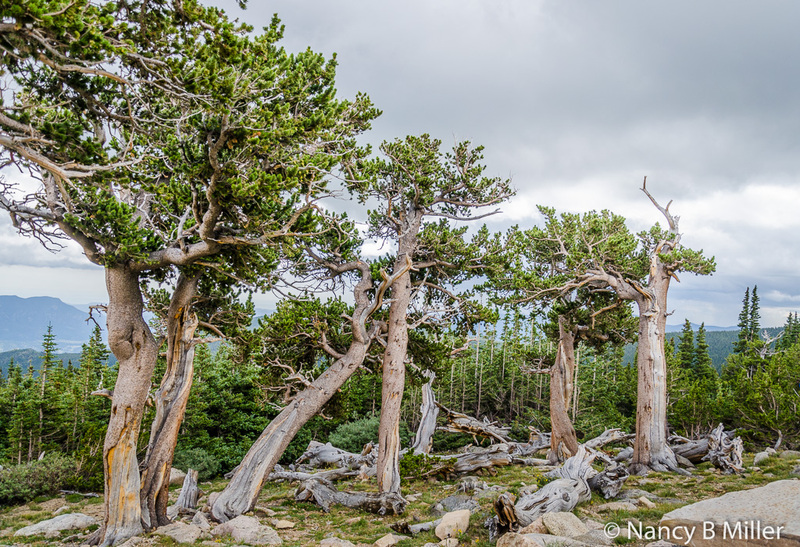 You’ll learn Bristlecone Pines are the oldest plant species growing on earth. 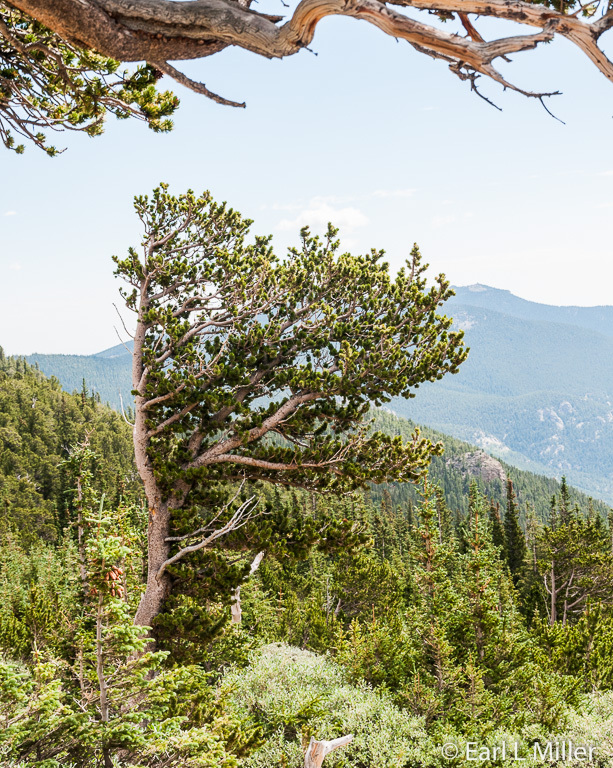 The most ancient one in the Mount Evans area is 1600 years old, but some in other locales of our nation have been around as much as 5,000 years. Our ranger, Theresa Fritz, gave an explanation of how these trees are dated by core samples. They have one growth ring a year. After the sample is taken, these pines fill in the center where the core was taken to protect themselves. The turpine oil in the trees produces like a SuperGlue between rings which is why they’re so hard. Bristlecone Pines appear very weathered and strong. At 11,200 feet in elevation, the timberline emerges. Here trees stop growing and the alpine tundra begins. At milepost six, visitors find Lincoln Lake Overlook. Over 800 feet below lies Lincoln Lake created by glacial action. Continuing up the road, you’ll view Roger’s Peak (13,391 feet) and Mount Warren (13,291 feet). Both are to your right. A broad expanse of tundra, Summit Lake Flats, lies to the left. 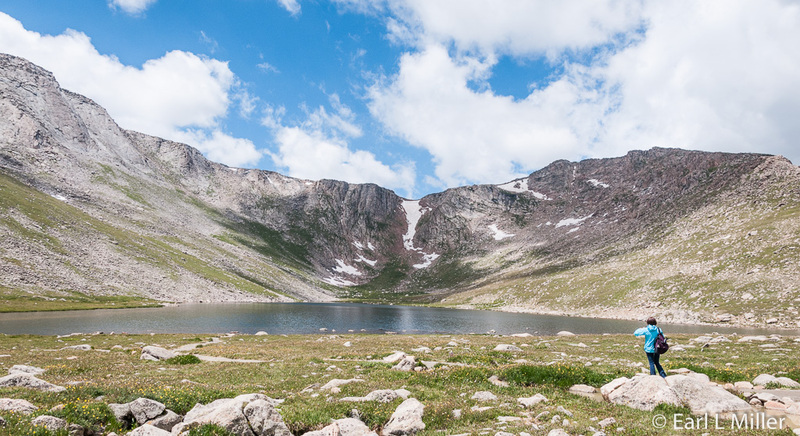 You’ll then approach Summit Lake, nestled in a glacial cirque, at an elevation of 12,830 feet. It was designated a Colorado Natural History Landmark in 1965. The Colorado Department of Transportation closes a gate leading to this section after Labor Day Weekend and opens it on Memorial Day. When the gate is open, make a stop at Summit Lake Park, the highest park in the Denver Park System. Despite its alpine location, its environment mirrors the arctic. Visitors find Permafrost (permanently frozen ground) and rare plants usually found above the Arctic Circle located here. Beware that parking is very limited. If you can’t find a space ascending the mountain, you can try it again on your way back down. Justus Roehling, a skilled German carpenter, built Crest House. Because of the 14,000 foot elevation, construction was difficult and took from the spring of 1940 to its completion in the fall of 1941. Roehling designed it with lots of glass for viewing the scenery and native stone so the structure would blend in with its environment. Machu Pichu’s Inca’s stone ruins inspired him. He also had other unusual architectural features. The coffee shop windows were pointed like tips of stars as they looked to the heavens, and light features, large round bulbs, represented the moon. It was the highest structure in the world. 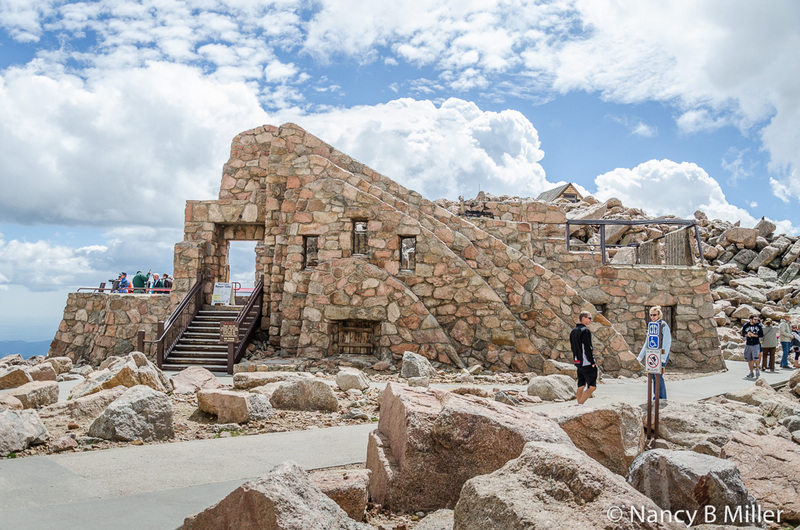 For 39 years, until a massive fire destroyed the building in 1979, it was a place for Mount Evans visitors to purchase lemonade, doughnuts, and souvenirs while receiving shelter. All that remains today are the ruins of its stone walls. The Forest Service will not rebuild this structure as Mount Evans has been declared a wilderness area prohibiting commercial enterprises. Two ranger talks are given at the Crest House Amphitheater. We heard “Different Coats for Different Goats” on our second Mount Evans trip. 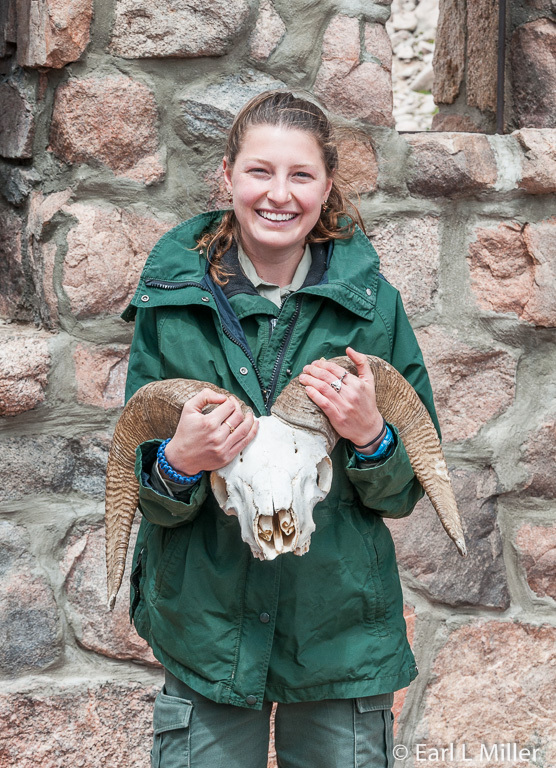 Theresa gave a 10-minute presentation at 11:45 a.m. on the characteristics of Bighorn Sheep and mountain goats. She had audience volunteers play different parts such as a sheep, goat, etc. as she told a story about these animals. We learned that goats don’t shed their fur but Bighorn sheep, who have two layers of fur, do. Male rams and goats have hollow horns with growth rings, like trees, that help determine an animal’s age. From 4-4:15 p.m., rangers give a talk called “Mountain Memories.” It can cover anything from the Crest House to Cosmic Ray research to more. John Evans, a physician, for whom Mount Evans was named, helped found Northwestern University located in Evanston, Illinois, a town named in his honor. He taught at Rush Medical College in Chicago. In 1862, he was asked by Lincoln to move to Colorado and assume political office. He was briefly the second Territorial Governor of Colorado. After his political career was over, he became a railroad promoter. The Colorado State Historical Society, Denver Chamber of Commerce, and United Charities of Denver were all organized under his leadership.